Back in January I bought a lot of fabric to make some clothes with. This last month I've finally been able to spend some time making some skirts. I'd found 2 tutorials on some of my sewing blogs and was excited to make them. They both offered me a chance to try something new in sewing. One of my goals this year is to make more clothes. I spent last year making curtains, pillow covers, quilts and purses so I really want to learn more about making clothes. Skirts are definitely the easiest thing to make and with summers being so hot and my desire to have comfy clothes they are my first choice. 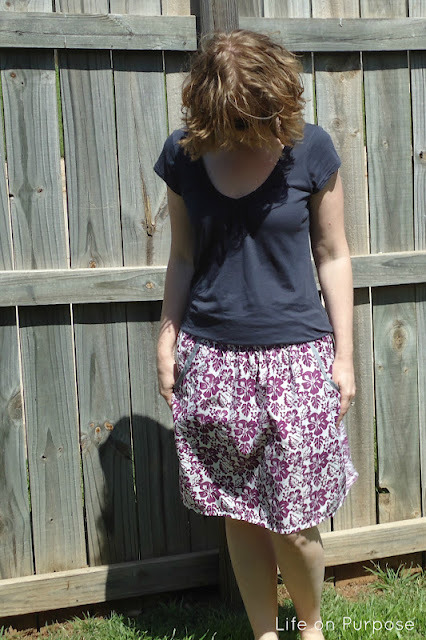 So the first one I made is called a Shirred Pocket Skirt. It's roomy, comfy and looked cute and simple enough to make. I've never made anything with pockets and never done shirring before but they were pretty easy. She explains how to sew the elastic thread but my sewing machine (Brother) seems to be very different when it comes to using it. I had to do some YouTube searches and google searches before I finally found something that explained how to use elastic thread on a Brother machine. If anyone is interested let me know in the comments and I'll track the info down again. So, I've made 3 so far. Although the first one I made I measured myself wrong and ended up making it way too big and due to the design I couldn't alter it without starting completely over, so I sent it to Goodwill. But the other 2 I can wear! On this purple one, I wanted to try bias tape for the first time and grey just seemed the natural choice for me. I love how it turned out! 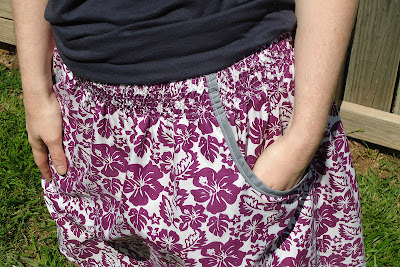 Here's a close up of the shirring and pocket detail. Here's the other. My favorite! I fell in love with this fabric and when I figured out how to make this skirt, I knew I had to make one using this fabric. I used a grey/blue thread, that I thought looks great with the green, it gives it a bit of contrast. And I while cutting pocket pieces I didn't cut enough and ended up not having enough fabric so I had to improvise. I found some white fabric scraps and it's on the inside of the pockets. It actually turned out looking pretty good, thank goodness! Here's a close up of the shirring and pocket detail. The other skirt is a short maxi skirt. In the original tutorial she made the skirt long, but I want these for summer and when it's 100 degrees outside I want a short, cool skirt. Although I think I'd like to make a couple long ones eventually to wear in the fall or spring. This skirt used knit fabric and while I've started a knit dress I hadn't finished it yet, so I've never finished anything using knit fabric. I was excited to sew with knit because it's super comfy and I like how it drapes. Her tutorial was so easy, and once I figured out my own pattern I could make one in less than an hour. I made 4 but the first one (which always seems the case) was too small and I didn't cut the fabric correctly. My tip with knit fabric is to look at which way it stretches. 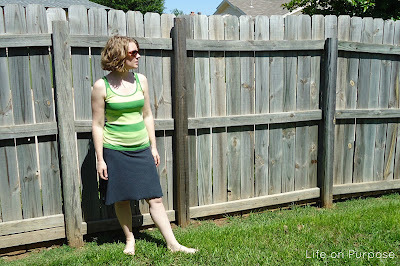 For these skirts I wanted the stretch to be horizontal not vertical. This one is made with a good weight grey. This pink knit has sparkles in it! It's the same weight as the grey but not quite as soft as the grey. While I do love the comfort of the skirt and having a color, I'm kind of stumped about what color shirt to wear with it, which explains the white. So if any one has any suggestions please share! Here's an idea of what the waistband looks like. It's like a yoga pant waistband. This is a tencel blue knit and it feels like butter! It's the softest of the bunch and super light, which is also why it's see-through! This one will either be an at home only skirt or I'll have to add another layer to it. And this grey tank needs to be hemmed, I have a short torso. 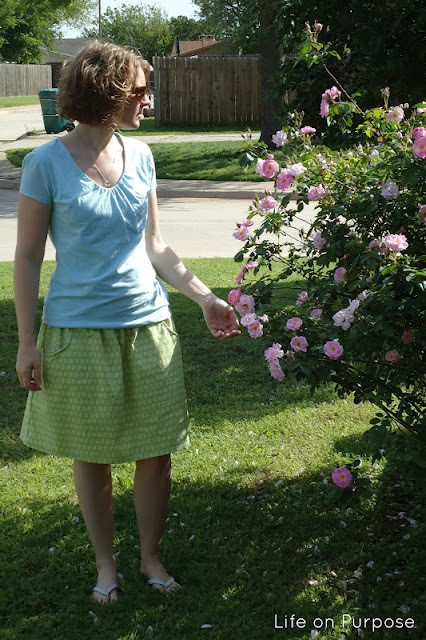 I made both skirts using my serger and sewing machine, but they can be made using just a sewing machine. The serger just gives a more professional finish and helps with stretch. 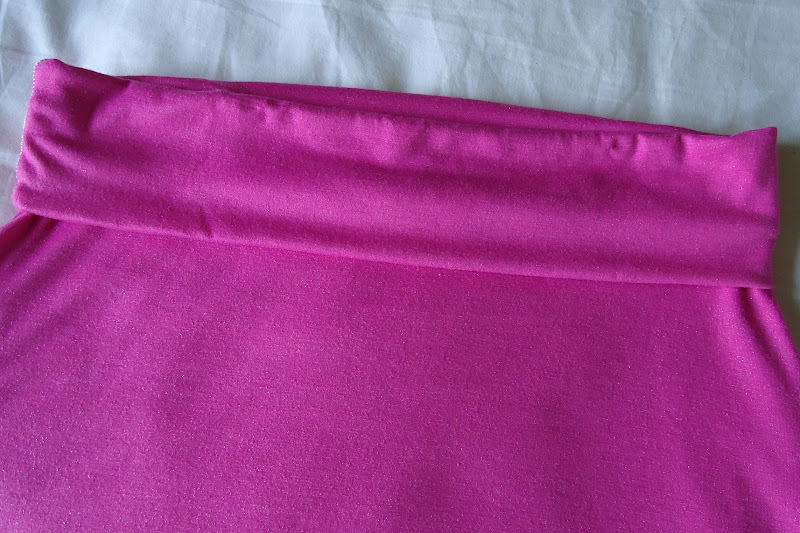 I really liked using the serger on the skirts it was really easy. 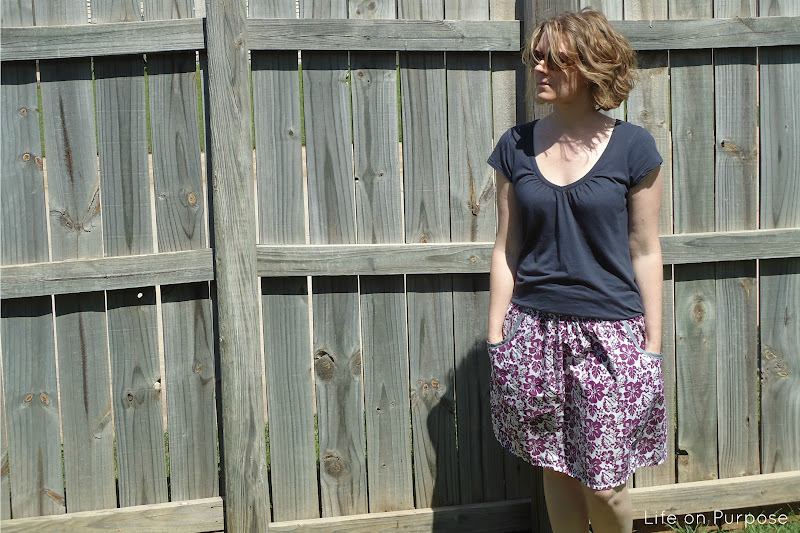 These are the most comfortable skirts I've ever worn and I LOVE them! I can't wait for more warm weather to wear these skirts more! I can't wait to make more, but I need some more fabric! I don't remember the brands or names of the fabric, sorry! So what do you think? And any ideas on what color top to wear with the pink one?